With the development of science and technology, digital publications are playing an important role in modern society. And a digital publication has many advantages over a traditional one. To build your brand or launch a promoting campaign with a company brochure, a digital brochure is much more effective and efficient because it can be easily accessed from online or cloud. It's high time you built digital brochures that are available from cloud, and it's high time you reached your audience on different platforms: PC, Mac, iPad, iPhone, Android, Kindle Fire, IE, Chrome, FireFox, etc. Pub HTML5 can be your smart choice and ultimate solution because this cloud-based digital distribution platform will help you build extraordinary digital brochures. And the output brochures are easily reached by readers from all over the world. How to build digital brochures with cloud-based digital distribution platform? Download and install Pub HTML5, and after you start the HTML5 digital brochure creator, click "Import File" to import a PDF file. 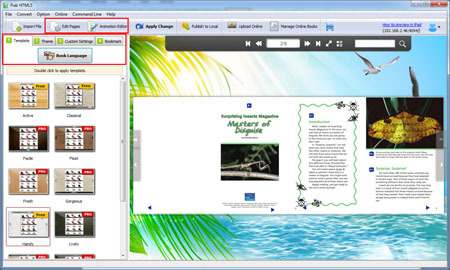 After you import the PDF, you will be directed to the Design Interface where you can customize the digital brochure with a lot of settings: template and theme for unique style output, logo for branding, background image and sound, print and download and so on. Besides, you can use Page Editor and Animation Editor to enrich the brochure with animated media such as video, YouTube, Vimeo, audio and photo slideshow. 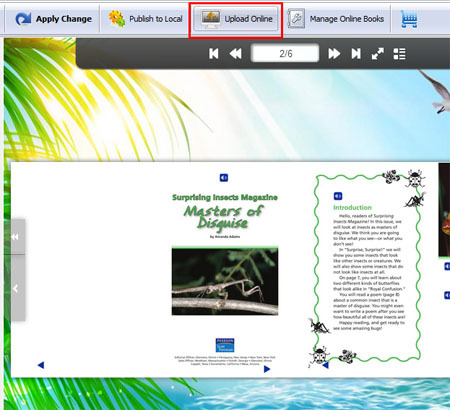 Click "Upload Online" icon to publish the digital brochure to our Online Hosting. And after the brochure is uploaded, your readers can read it on PC, Mac and mobile via browsers.